Scrollable image slider is one of the interesting features in the image gallery application. This allows us to display thumbnails in the form of slides that can be scrolled automatically or manually using the control buttons. Figure below shows a scrollable image slider featuring four thumbnails per slide. To display thumbnails from another slide, simply by clicking the navigation buttons located on the right and left slide. Slides can also be scrolled automatically by using the left and right arrow keyboard or using the mouse wheel. Download Scrollable component from download page and save it as jquery.tools.min.js. 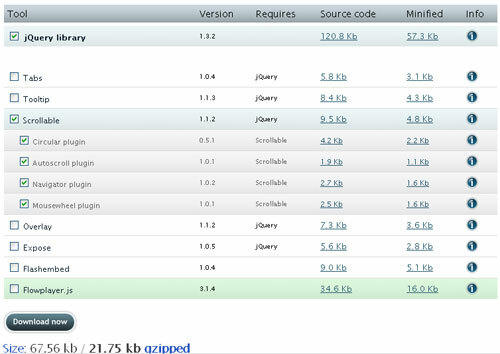 You can download it with jQuery (v1.3.2) as a single file (21.75 kb) or as a separated file (3.37 kb) if you already have jQuery. line 01: element for left/prev button. line 02: root element (div) for the scrollable. line 04-20: scrollable images (will be displayed four images per slide). line 24: element for right/next button. line 01, style for container element, the length and width depends on image size and how many images you want displayed per slide. line 12, style for wrapper element. line 18, style for images in a slide. line 30, style for selected image. line 01, allow next and prev buttons placed on each side of the slide. line 12, set size and position of prev and next buttons. line 16, set background image for prev and next buttons. $(“div.scrollable”) is a jQuery selector for scrollabe container. On example above, we set four images for each slide using configuration parameter ‘size‘. Default value of ‘size‘ parameter is 5. You can learn more about the API of the Scrollable component on this page. I very enjoy this fantastic post which are provided for us. I confirm this would be advantageous for most of the people. I am looking for a scrollable gallery like this (Non-Flash) that shows all thumbnail images black and white – then when you roll over a thumbnail image it becomes full color AND populates in a full size larger cell above the gallery scroll bar, is this possible? If so, how would this be accomplished? I’ve been looking for something like this! Thanks for sharing this great tool! it makes you wonder where people get the idea that short-term planning will yield immediate rewards. Thank you so much for this tutorial! This will surly! I can now finish my website off for a college assignment! How would you modify this to display information text when each picture is clicked on a different portion on your website? Hello! eegdagf interesting eegdagf site! I’m really like it! Very, very eegdagf good! Hi I am new to JQuery what do I need to download before incorporating the code ?